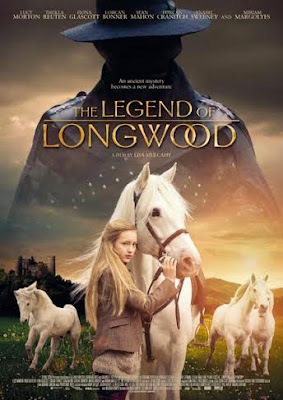 "A beautiful new film out of Ireland, TheLegend of Longwood, is coming to DVD on June 4th from Shout! Factory, following its appearance at several film festivals in early 2015. An adventure for all ages, the release includes a fascinating behind-the-scenes featurette as a bonus feature." When it comes to movies, I have always been a fan of international and Indie type films. Because of limited budgets or little promotion of titles, it is nice to stumble across movies that others haven't heard of that really take your breath away and make you excited to sit down and watch the movie. A few weeks ago, I was asked to review the upcoming "The Legend of Longwood," which is releasing on DVD on June 4th from Shout! Factory. I had never heard about this title, so went to YouTube to see if there was a trailer available. And, after watching it and doing a search for more information on this film out of Ireland, I quickly asked for a review copy, as this was definitely one movie I wanted to see and share with my family. As you can see from the movie trailer, this film is filled with breathtaking landscapes of rural Ireland, all set to the music from Brave composer, Patrick Neil Doyle. This coming of age film, is about a fearless 12-year old on a quest of sorts. Not only is the landscape amazing, bu the crumbling castles and beautiful horses really make this a must see movie that will have you hooked from the first few minutes. "The film stars Lucy Morton as Mickey Miller, a thoroughly modern 12-year-old American girl whose great love is horses.Not surprisingly, she has little enthusiasm for her mother’s plan to take Mickey and her little brother to start a new life in a run-down mill she has inherited in Longwood, a windswept Irish town at the end of the world. Mickey’s presence in Longwood coincides with the return of the Black Knight, a legendary ruler who found no peace after his baby daughter was taken from him, and whose appearances always mean that something evil is going to happen to the villagers. Mickey hears and sees things that others can’t, and forms an immediate bond with Silver, the proudest, haughtiest, most untamable horse in the stalls of a nearby castle. Realizing that she is directly linked to the story of the Black Knight, Mickey and her new friend Sean set out to redeem the knight so as to bring lasting peace to Longwood. But first she must save the lives of seven horses and thwart the evil plans of a greedy, ambitious woman – a mighty handful even for the bravest girl!" I would love to see this movie it sounds amazing. I will have to check it out on Youtube too the horses look so pretty.